Prior to the establishment of Middleborough High School which graduated its first class in 1876, students wishing to pursue higher education had few alternatives to expensive college preparatory academies such as Middleborough’s Peirce Academy which was beyond the financial reach of most families. One local alternative to such academies was the Middleboro' Boys’ School (later and best known as the Eaton Family School), which operated on East Grove Street for four decades as a boarding school for boys headed successively by Reverend Sylvester W. Marston (1854-56), Reverend Perez L. Cushing (1856-74) and Reverend Herrick M Eaton and his son Amos H. Eaton (1874-98). What surely must have been a highlight of the spring season at the school were the outings along the Nemasket River downstream to Lake Assawompsett. “The teacher occasionally takes the school into a boat and gives them a water excursion, some four or five miles across the Pond, at the head of the river.” Such ventures helped supplement the study of botany and zoology undoubtedly provided to the students at the school. Despite the success of the school, Marston did not operate it long. In the spring of 1856, he decided to pursue his luck out West along with Middleborough merchants Solomon Snow and George Wilbur. The contents of the school were auctioned, and the property sold on April 19, 1856, to Reverend Perez Lincoln Cushing. Little is known about the Cushing School, in part due to the fact that local newspapers from a portion of the period during which the school was in operation have not survived. Cushing, a native of Hingham, maintained the boys school much along the lines of its founder, Sylvester Marston, and he was assisted in this work by his wife, Lavinia M. (Parker) Cushing, a former proprietress of Peirce Academy. Cushing's school proved popular, attracting students from across the commonwealth, and the number of students seeking admission generally exceeded the available places. The school property was enlarged through the purchase of three adjacent parcels from Joseph T. Wood in 1856 and 1857, providing room for Cushing’s prize-winning livestock and accommodating his hobby of horticulture. During Cushing's proprietorship, the school, was noted for its extensive pear orchards where more than sixty varieties of fruit were raised. The pears began to ripen each July, and late pears were available the following May. In 1862 Cushing's pears took third prize at the Plymouth County Fair. The following year, they won the blue ribbon. Despite a severe paralytic stroke in the summer of 1868 that left him temporarily speechless, Cushing rallied from his illness and continued to conduct the school for another five years. During this period he turned to grape cultivation as a respite from schoolwork. During the 1871 season, Cushing raised some 100 bushels (two tons) of Concord grapes. Following the 1874 spring school term, Cusing sold the school, to Reverend Herrick M. Eaton and his son, Amos H. Eaton, under whom it would achieve its greatest success. 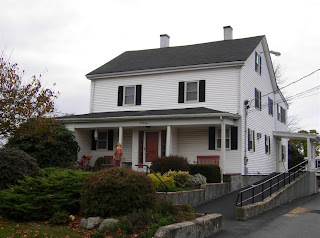 Former Middleboro' Boys' School, 25 East Grove Street, Middleborough, MA, photograph by Mike Maddigan, November 7, 2010. 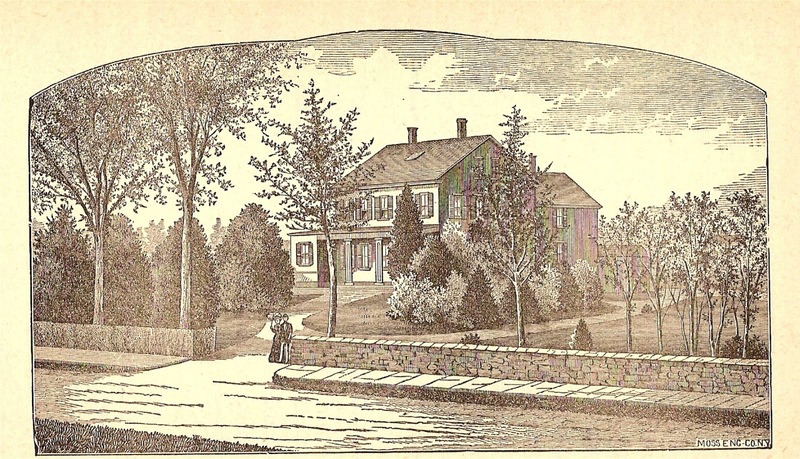 Constructed in 1854, the residence at 25 East Grove Street served as a boarding school known successively as the Middleboro' Boys' School and the Eaton Family School until 1898. Used since that time as a commercial property, the school building later housed Heritage Oil. 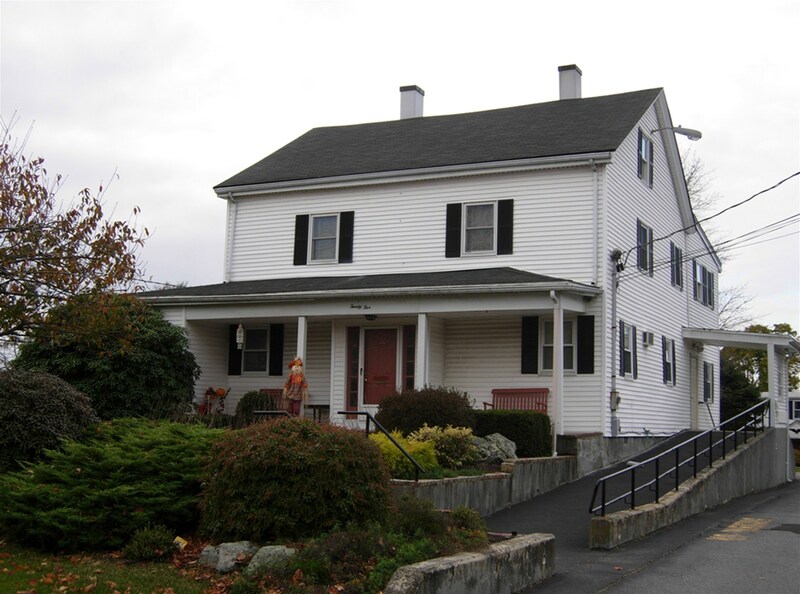 It is now the home of Cranberry Country Child Care, a perhaps fitting occupant given the building's place in Middleborough's educational history. Namasket Gazette, May 26, 1854, page 2. 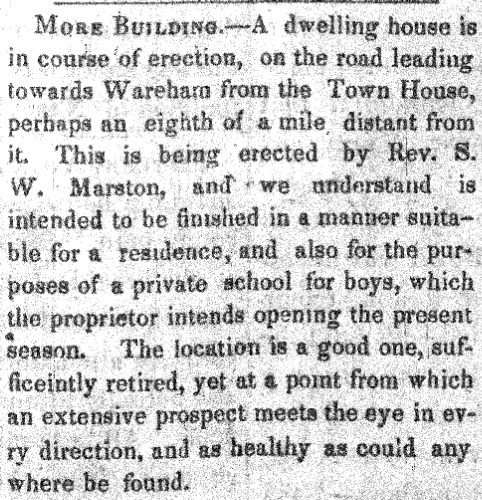 The construction of Reverend Sylvester W. Marston's proposed school was documented by the local newspaper in the spring of 1854. Engraving, Marston's Family School, mid-19th century. The former Middleboro' Boys' School building on East Grove Street has changed little in the past century and a half as evidenced by this promotional engraving from the period. Though the stone walls and landscaping which provided the school with a favorable rural setting have long since disappeared, the structure itself remains relatively unaltered on the exterior. 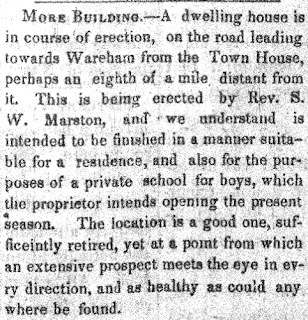 Middleboro' Boys' Family School notice, Middleboro Gazette, November 19, 1859, page 2. "Card of Thanks" from The Family School, Middleboro', Mass. circular, 1874. Lavinia Marie Parker b. Corinth, Maine 4 Feb. 1822 [the only child not born in Cavendish, Vt.] daughter of Joseph & Amy (Baldwin) Parker of Cavendish. At the time of her birth the family were occupying and carrying on a farm, store, and house belonging to Mr. Fleichman in Corinth. They returned to Cavendish soon after her birth. "Linny" was described as of medium height, blue eyes, round face, brown hair, indented chin. She was scholarly and a superior mathematician. She was named for the wife of Addison Parker. She m. in Middleborough, Perez Lincoln Cushing of Hingham (b. Boston 5 March 1822). Perez received his A. M. Degree from Brown University in 1849. He was ordained 8 Aug. 1855 and began his work in Westborough where he was from 1851-1857. Then he served Middleborough until 1874. They lived in Middleborough, Mass., where Lavinia ran a private boarding school. Recollecting Nemasket is a web log about the history of Middleborough and Lakeville, Massachusetts. In addition to publishing local history articles, Recollecting Nemasket seeks to be an interactive educational resource for community history by providing links to historical information and sources, and by soliciting input from readers in the form of recollections, photographs and other images. Please feel free to comment upon the articles, to record your recollections or to contact me with any stories or images you might wish to share with others. If you wish to use images or text from this site, please include a link or credit to Recollecting Nemasket. Recollecting Nemasket was honored to be able to contribute to the inaugural edition of Middleborough's new digital magazine which features hsitoric Titicut. Available from local and on-line booksellers. Wootonekanuske and Teweeleema, more familiarly known as Charlotte and Melinda Mitchell, were the last descendants of Massasoit and lived at Betty's Neck in Lakeville. Formed in 1907 as the first cranberry growers' cooperative in Massachusetts, the New England Cranberry Sales Company was headquartered at Everett Square in Middleborough. In 1954, it merged with Ocean Spray. Celebration of the Two-Hundreth Anniversary of the Incorporation of Middleborough, Massachuestts, October 13, 1869. Middleborough, MA: Town of Middleborough, 1870. Ebenezer W. Peirce. Historic Sketches of Hanson, Lakeville, Mattapoisett, Middleboro', Pembroke, Plympton, Rochester, Wareham, and West Bridgewater. Boston, MA: E. W. Peirce, 1873. Ebenezer W. Peirce, "History of Middleboro'" in D. Hamilton Hurd. History of Plymouth County, Massachusetts, with Biographical Sketches of Many of Its Pioneers and Prominent Men. Philadelphia, PA: J. W. Lewis & Co., 1884. Thomas Weston. History of the Town of Middleboro, Massachusetts. Boston, MA: Houghton, Mifflin and Company, 1906. Albert H. Washburn. Historical Address Delivered on the Occasion of the Two Hundred and Fiftieth Anniversary of the Town of Middleborough, Massachusetts. Np: np, 1919. Mertie E. Romaine. History of the Town of Middleboro, Massachusetts. Volume II. Middleborough, MA: Town of Middleborough, 1969. Marilyn Thayer. Middleborough Through the Ages. Middleborough, MA: Rock Village Publishing, 2012. Ebenezer W. Peirce, "History of Lakeville" in D. Hamilton Hurd. History of Plymouth County, Massachusetts, with Biographical Sketches of Many of Its Pioneers and Prominent Men. Philadelphia, PA: J. W. Lewis & Co., 1884. Gladys Vigers. History of the Town of Lakeville, Massachusetts. Lakeville, MA: Town of Lakeville, 1952. Phyllis Elliott Draghetti and D. Evelyn Sylvia Norris. History of the Town of Lakeville: The Next Twenty-Five years 1953-1978. Lakeville, MA: Town of Lakeville, 1978. Walter O. Thompson, Jr. Thompson Collection. Volume 1. Middleborough, MA: Middleborough Public Library. Walter O. Thompson, Jr. Thompson Collection. Volume 2. Middleborough, MA: Middleborough Public Library, 2004. Michael J. Maddigan. Images of America: Middleborough. Charleston, SC: Arcadia Publishing, 2009. Preserve Our Lakeville Landmarks. Lakeville Then and Now. Lakeville, MA: Preserve Our Lakeville Landmarks, 1993. Gail E. Terry. Images of America: Berkley, Freetown, and Lakeville. Charleston, SC: Arcadia Publishing, 2007. Helen Caswell, et al. North Middleborough Looks Back. Middleborough, MA: np, 1976. Michael J. Maddigan. Muttock: Middleborough's Revolutionary Village. Middleborough, MA: Recollecting Nemasket, 2015. Michael J. Maddigan. South Middleborough: A History. Charleston, SC: The History Press, 2011. Eddyville, Middleboro, Massachusetts: 1661-1987. Middleborough, MA: The Eddy Homestead Association, 1988. The Lakeville Historical Tour Committee Presents Dartmouth Path - The Old Stage Road. Lakeville, MA: Preserve Our Lakeville Landmarks, 2001. The Lakeville Historical Tour Committee Presents Old Main Street and Crooked Lane & A Self-Guided Tour of Main Street. Lakeville, MA: Preserve Our Lakeville Landmarks, 2003. Michael J. Maddigan. Lakeville's King Philip Tavern: An Illustrated History. Lakeville, MA: Preserve Our Lakeville Landmarks, 2010. The Lakeville Historical Tour Committee Presents Historic Pierce Avenue. Lakeville, MA: Preserve Our Lakeville Landmarks, 2001. Kenneth C. Leonard, Jr. The Beechwoods Confederacy 1709-1809: The Colonial History of Beechwoods Middleboro-Taunton Precinct, Massachusetts. Bowie, MD: Heritage Books, 2003. Ebenezer W. Peirce. Indian History, Biography and Genealogy: Pertaining to the Good Sachem Massasoit of the Wampanoag Tribe, and His Descendants. North Abington, MA: Zerviah Gould Mitchell, 1878. Lincoln Newton Kinnicutt. Indian Names of Places in Plymouth, Middleborough, Lakeville and Carver, Plymouth County, Massachusetts, with Interpretations of Some of Them. Worcester, MA: Lincoln Newton Kinnicutt, 1909. Alvin G. Weeks. Massasoit of the Wampanoags. Fall River, MA: Alvin G. Weeks, 1919. Benjamin Church et al. The History of King Philip's War. 1st ed. Boston: Howe & Norton, 1825. 1827 ed. 1829 ed. 1840 ed. Thomas Church. History of Philip's War. Boston: J. H. A. Frost, 1827. Daniel Strock, Jr. Pictorial History of King Philip's War. Boston: Horace Wentworth, 1851. John S. C. Abbott. History of King Phillip, Sovereign Chief of the Wampanoags. New York: Harper & Brothers, 1857. Franklin B. Hough. A Narrative of the Causes which Led to Philip's Indian War of 1675 and 1676. Albany, NY: J. Munsell, 1858. Increase Mather et al. The History of King Philip's War. Boston: Samuel G. Drake, 1862. William Hubbard. The History of the Indian Wars in New England from the First Settlement to the Termination of the War with King Philip, in 1677. Roxbury, MA: Samuel G. Drake, 1865. Volume 1. Volume 2. Richard Markham. A Narrative of King Philip's War and the Indian Troubles in New England. New York: Dodd, Mead & Company, 1883. George Madison Bodge. Soldiers of King Philip's War Being a Critical Account of that War. 1st ed. Leominster, MA: George Madison Bodge, 1896. 3rd ed., 1906. George W. Ellis and John E. Morris. King Philip's War. New York: The Grafton Press, 1906. Douglas Edward Leach. Flintlock and Tomahawk: New England in King Philip's War. Np: np, 1958. Russell Bourne. Red King's Rebellion: Racial Politics in New England 1675-1678. New York: Oxford University Press, 1990. Jill Lepore. The Name of War: King Philip's War and the Origins of American Identity. New York: Alfred A. Knopf, Inc., 1998. Yasuhide Kawashima. Igniting King Philip's War: The John Sassamon Murder Trial. Lawrence, KS: University Press of Kansas, 2001. Michael J. Maddigan. Nemasket River Herring: A History. Charleston, SC: Natural History Press, 2014. Joseph D. Thomas, ed. Cranberry Harvest: A History of Cranberry Growing in Massachusetts. New Bedford, MA: Spinner Publications, Inc., 1990. Edward and Yolanda Lodi, Cranberry Memories: Voices from the Bogs. Middleborough, MA: Rock Village Publishing, 2009. Stephen Cole and Lindy Gifford. The Cranberry: Hard Work and Holiday Sauce. Gardiner, ME: Tilbury House Publishers, 2009. Lydia Rotch. The Lakeville Historical Tour Committee Presents the History of Hill Top Farm in the Words of Lydia Rotch. Lakeville, MA: Preserve Our Lakeville Landmarks, 2009. Michael J. Maddigan. Star Mill: History & Architecture. Middleborough, MA: Recollecting Nemasket, 2012. Howard T. Smith. Maxim Fire Apparatus Photo History. Hudson, WI: Iconografix, 2004. Howard T. Smith. Maxim Fire Apparatus 1914-1989 Photo Archive. Hudson, WI: Iconografix, 2001. Michael J. Maddigan. The Famous Trotting Ground: A History of Middleborough's Fall Brook Driving Park. Middleborough, MA: Recollecting Nemasket, 2014. Michael J. Maddigan. Representatives of the Great Cause: Middleborough Servicemen & Their Letters from the First World War. Middleborough, MA: Recollecting Nemasket, 2013. The Lakeville Historical Tour Committee Presents Salute to Those Who Serve. Lakeville, MA: Preserve Our Lakeville Landmarks, 2002. Israel W. Putnam. Two Discourses on the Divine Faithfulness, as Illustrated in the History of the First Church in Middleborough, Mass., During the Period of One Hundred and Fifty Years. Boston: Charles C. P. Moody, 1852. Book of the First Church of Christ, in Middleborough, Plymouth County, Mass. Middleborough, MA: First Congregational Society of Middleborough, 1852. First Church in Middleborough, Mass: Mr. Putnam's Century and Half Discourses; an Historical Account; and a Catalogue of Members. Boston, MA: First Congregational Society of Middleborough, 1854. Two Hundreth Anniversary of the First Congregational Church of Middleboro, Mass. Middleborough, MA: First Congregational Society of Middleborough, 1895. S. Hopkins Emery. The History of the Church of North Middleborough, Massachusetts. Middleborough, MA: North Middleborough Congregational Society. 1876. Mertie E. Witbeck. History of the Central Congregational Church, Middleborough, Massachusetts 1847-1947. Middleborough, MA: Central Congregational Society, 1947. Peter Benes. The Masks of Orthodoxy: Folk Gravestone Carving in Plymouth, Massachusetts, 1689-1805. Amherst, MA: University of Massachusetts Press, 1977. Charles M. Thatcher. Old Cemeteries of Southeastern Massachusetts: A Compilation of Records by Charles M. Thatcher in the late 1880s. Middleborough, MA: The Middleborough Public Library, 1995. John W. Willard. "Records from the Nemasket Cemetery, Middleborough, Mass." The Mayflower Descendant. XV:1. January, 1913, pp. 1-9. Michael J. Maddigan. Elysian Fields: An Illustrated History of Rock Cemetery. Middleborough, MA: Rock Cemetery Association, 2007. Jean A. Douillette. Lakeville, Massachusetts Gravestone Inscriptions 1711-2003. Lakeville, MA: Urn and Willow Publishing, 2007. Alvah Hovey, A Memoir of the Life and Times of Rev. Isaac Backus, A. M. Boston, MA: Gould and Lincoln, 1858. Mertie E. Romaine. General Tom Thumb and His Lady. Taunton, MA: William S. Sullwold Publishing, Inc., 1976. George C. Decas. Col. Peter H. Peirce (1788-1861): A Plymouth County Life. Middleborough, MA: Middleborough Historical Association, 2001. Alfred F. Young. Masquerade: The Life and Times of Deborah Sampson, Continental Soldier. New York: Alfred A. Knopf, 2004. Charles Henry Alden. Eliab Alden of Middleborough, Massachusetts, and Cairo, New York, His Alden Ancestors and His Descendants. Boston: np, 1905. Ignatius Thomson. A Genealogy of John Thomson, Who Landed in the Month of May, 1622. Taunton: E. Anthony [printer], 1841. Charles Hutchinson Thompson. A Genealogy of Descendants of John Thomson of Plymouth, Mass. Lansing, MI: Darius D. Thorp [printer], 1890. Alfred Wood. Record of Deaths, Middleboro, Massachusetts. Boston, MA: General Society of Mayflower Descendants, 1947. Clint Clark. By the Way ...: One Man's Corner of New England. Middleborough, MA: Rock Village Publishing, 2006. Susan Ashley French. Toys in the Sand: Recovering Childhood Memories in Lakeville, Massachusetts. East Freetown, MA: Susan Ashley French, 1989. The Plymouth County Directory and Historical Register of the Old Colony. Middleborough, MA: Stillman B. Pratt & Co., 1867. The Lakeville, Freetown and Berkley, Massachusetts, Directory: 1911-12. Providence, RI: C. DeWitt White Co., 1911. Since 1997 I have been writing a local history column for the Middleboro Gazette entitled "Recollecting Nemasket". Now it's time to take it online. All content of Recollecting Nemasket is copyright 2009-2018 by Michael J. Maddigan. All rights reserved.